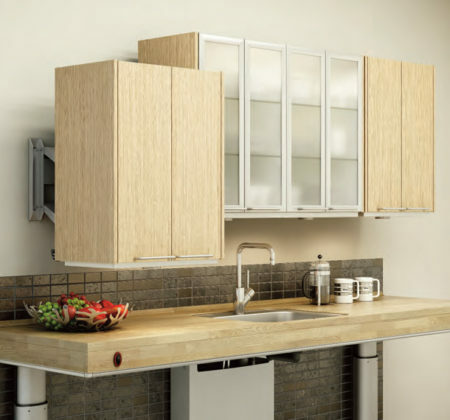 Our powered wall cabinet lifts from Indivo can be fitted to cupboards of 500 – 704mm in height and up to 2.4m long. The height can be extended to 900mm by fitting a plate. A one lift motor is used for cabinet widths of 400mm – 1200mm and has a load capacity of 110kg. Using a two lift motor for cabinets 1201mm – 2400mm the capacity doubles to 220kg. The frame will adjust down from its optimum height by 430mm and extend toward the user by 180mm.